However, when it comes to choosing interior window designs, there are a ton of questions clients have but often find answers difficult to come by. 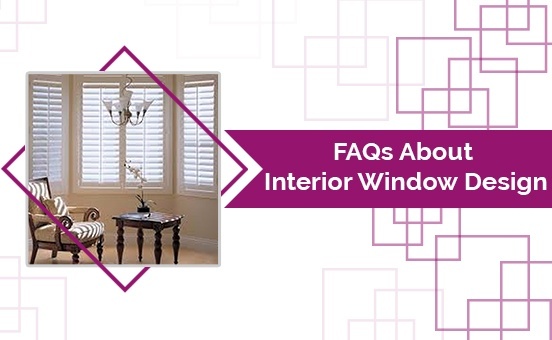 DC Shutters wants to arm you with the most accurate information available to help you find suitable window coverings for your home and to do this, we’ve answered some of the most frequently asked questions about interior window design. 1. Can I move shutters from house to house? It is not possible to move window shutters from one house to another because shutters are custom made to fit your window measurements. Window shutters are permanent fixtures and make good investments, as they add to the resale value of your home. 2. What is the difference between real wood and faux wood shutters? There are a number of advantages of installing faux wood shutters, but the cost is the primary benefit. The price of faux wood is usually twenty-five percent less than the price of real wood shutters. In terms of looks, the faux wood plantation shutters look identical to real wood. Faux wood is often seen as a sensible choice for window coverings, as it requires less maintenance compared to real wood. 3. What color choice do you offer for shutters? Your shutters can be custom painted to match any color sample you require. We are very flexible when it comes to color choices. However, we offer standard white and off-white as a first choice. 4. What kind of warranty do you offer on shutters? In case of any defects found in craftsmanship or installation, DC Shutters offers a twenty-five-year manufacturer’s warranty on vinyl shutters and twenty-year warranty on wooden shutters. 5. How can I clean my plantation shutters? Plantation shutters are very simple to clean because of their large louvers and tilt bars which are either hidden or mounted on the rear. You can simply tilt the louvers open and dust them or just wipe any smudges off with a damp cloth. 6. How much will it cost to have my windows measured for shutters or blinds? Window measurements are mainly taken to determine the cost of window coverings. At DC Shutters all window measurements are done for free by our team as part of your home consultation. Our expert installers can get you an exact measurement so that your shutters will fit your windows seamlessly, even in hard to reach areas or windows with unique shapes. 7. What is your payment system? At DC Shutters we accept a forty percent advance on the placement of orders. The rest of the amount is due on the day of the installation of the window coverings. We accept payments in cash, check or e- transfer. If you have any more questions about interior window design, get in touch with the experts at DC Shutters. As window treatment specialists in Toronto, ON, we provide repairs, repainting, refinishing and installation of window shutters. To learn more about how we can help you, please click here or contact us by clicking here.